Today we’re going to go into a little bit of detail about a choice we made when building our test version of the Open Voice Factory. One of the unusual things about the video we put out a few months back is the choice of using PowerPoint to edit AAC pagesets. We’d like to talk about that in a bit more detail today (there was some technical detail about the process here). Editing interfaces for AAC devices are hard. Much much harder than the speech interfaces. 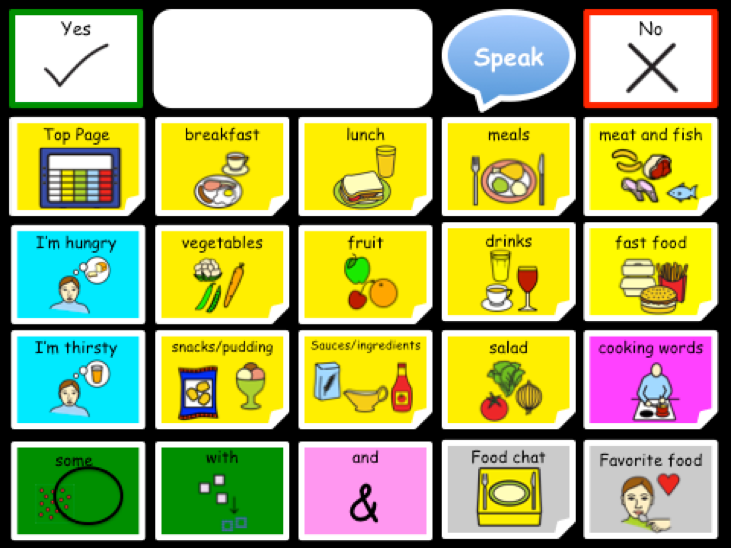 It’s simple to write an AAC device that just makes noises (and many of the apps listed on Apps4AAC are exactly that), it’s much much harder to write a decent editing interface. So it’s hard to do. It’s particularly hard to do well. 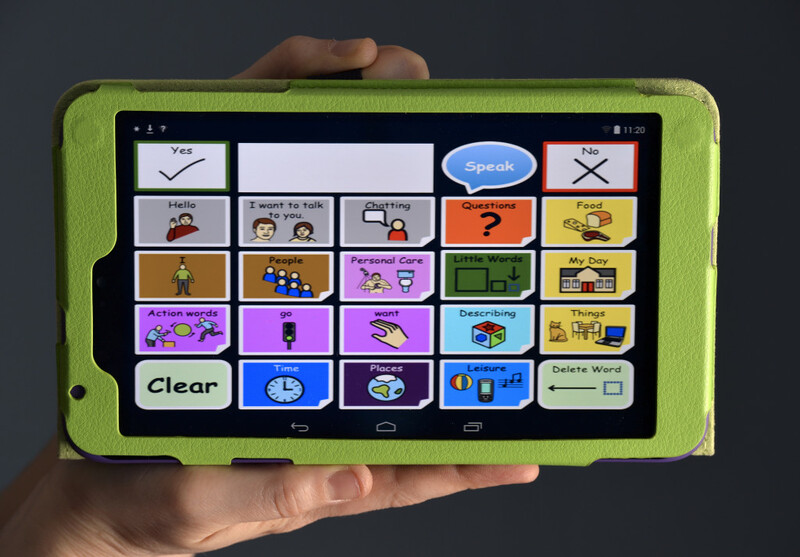 One reason is because most people (who in the particular context we are looking at are parents, carers, and so on) who modify the content on AAC devices have low levels of IT literacy: so the design has to be friendly, intuitive, and ‘risk-free’. If users think they might potentially break a vitial device then they are unlikely to pick it up at all. There is also something fundamental about the hardware. Doing any sort of complex task on a tablet is hard. Tablets are portable, pretty, easy to play with and really good for certain tasks like reading books and browsing the internet. But there is a reason I’m writing this article on a nice clicky keyboard in front of a monitor – some things are just much easier to do off the device. This isn’t a new insight – most of the major manufactures have a way of editing the device offline – but it’s still a delicate act to put it back on again. Of course, you then have to maintain two separate editing interfaces and that’s doubled your problems. I wish we could say we thought carefully about what we needed and came up with a good idea, but in truth I was avoiding even thinking about an editing interface. I was working on getting the CommuniKate pagesets up and running on the demo and hoping that something would sort itself out. It occurred to me that PowerPoint had an open format so it was possible that I could open up the file and extract utterances automatically. Five minutes looking at the internals suggested that this was a bad idea, but a short browse on the internet found python-pttx – a library designed to let python programers work with PowerPoint files. With a certain amount of work, and a lot of fixing things up afterwards. I wrote a short script in python that extracted most of the text from the PowerPoint and reduced my workload a lot. After a bit of a think, it started to occur to me that we could make the PowerPoint parser do a lot more. I mentioned this to a volunteer coder who managed to write the subtle and complex code that extracted the images from the program. Suddenly we were cooking with gas. We could create any AAC pageset we liked just by altering a PowerPoint template, and in a way that was deeply intuitive for our users. We decided to really commit to this, because we started to understand that we might have a really nice alternative to the standard editing interface. We put up a code bounty to extend the library that we were using and when it was completed, we found that there was only tidying up to do before we had something worth showing off. We don’t think that all AAC systems should edit the content like this. A lot of the reasons this works really well for us are the results of our general approach rather than this particular feature. For example, because anyone can upload a PowerPoint file and near-instantly start using the resulting AAC web-app, it’s clear to anyone that, as long as you keep the old files around, it’s pretty hard to break the system by accident. This makes it much more fun for people to experiment. On the other hand, if we were charging users every time the created a web-app, then we’d lose all of that spontaneity. More to the point, our goal is that everybody has access to AAC, not that everyone has access to our AAC. If we were focused on profit, then we would have much less motive to make the system so accessible. In fact, our work will export to the Open Board Format. So you will both be able to edit files for The Open Voice Factory using a handy PowerPoint template, and be able to edit your files for any device that is compatible with the Open Board Format.